June 11-15 and June 18-22, 2018, 9 a.m. to 3 p.m.
Sign up for 1 week or both. 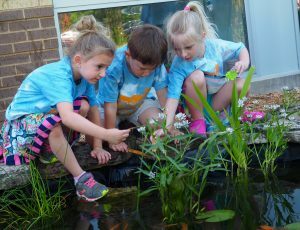 In our outdoor learning labs, art studio and gymnasium, Mirowitz STEAM Academy educators take children on an intellectually and creatively stimulating journey. Each day will include music, water play, cooking, a mitzvah project and physical activity, and will follow a theme that allows the integration of science, technology, engineering, art and math…all through a Jewish lens. STEAM Week Summertime Discovery is developed by Mirowitz faculty members to incorporate meaningful hands-on exploration, joyful Jewish moments and opportunities to better the world.